North Georgia is literally rolling with peaks and valleys so finding a good road trip isn’t hard to do. Just get in your car and start driving and odds are you’ll stumble into some of the prettiest views in the state. 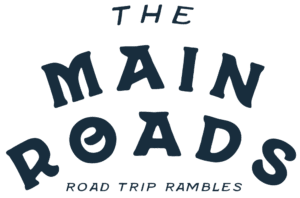 To help you narrow it down though we’re going to start sharing some of our favorite road trips complete with the best places to eat, drink, shop, and wander along the way. Remember you can use our North Georgia map to check out a full list of places we have already reviewed along the route for more detailed information on our recommendations. Before we get started we have one important note for driving in the mountains – please keep an eye out and drive safely around cyclists and motorcycles. Our two wheel friends love the mountains as much as we do and these roads pack a lot of visitors into a very small area made up of winding 2 lane roads. 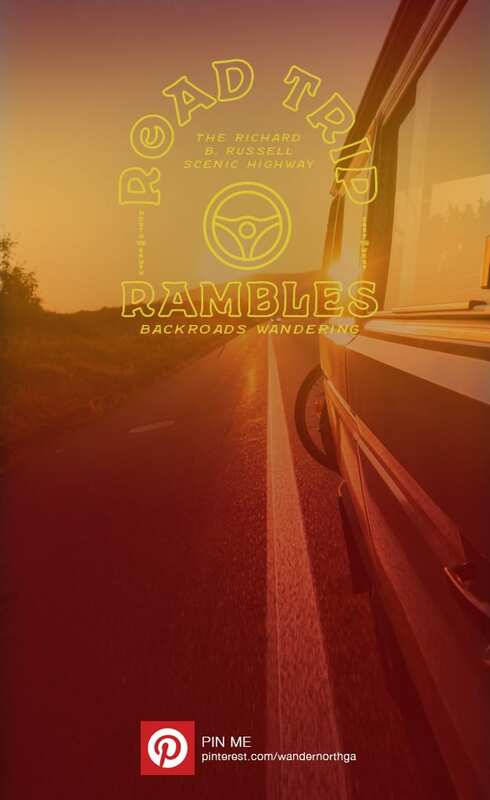 Blind spots, steep inclines, and fast declines make up the majority of these trips and particularly the one we’re going to cover today, the Richard B. Russell Scenic Highway. Cyclists often have road races with hundreds of riders, particularly in warmer months and motorcyclists are always taking advantage of the nice weather. When you see a cyclist, take your time and only pass them when you have plenty of space to move clear of the rider to your right. And when you see a motorcycle, relax and cruise along with them. In general, take your time. There is no where more important to be than exactly where you are. So enjoy it and the views. Now to one of our favorite drives, The Richard B. Russell Scenic Highway. The entirety of the Richard B. Russell Highway is only 23 miles long but the way we’ve laid it out is with some recommended side roads and detours that will let you make a half loop, full loop, or help you just get lost if that’s what you’re into. The highway is on the eastern side of Chattahoochee National Forest. If you’re coming from Atlanta, the easiest way to get started is to head towards Helen. The red line is the Richard B. Russell Highway while the blue lines show that you can take a left or right and choose your own adventure (details below). Finally the green lines show you some side roads you can take to extend your trip and get to some additional spots. One of our favorite spots to stop before we get going is right in Helen at Betty’s Country Store. Betty’s is an independent grocery store so you can stock up just about anything you need here. But we always like to grab a deli sandwich to go. Just hop up to the counter and fill out one of their forms and make a sandwich from scratch. By all means eat here if you’d like but we typically bring it with us for a picnic somewhere along the way. From Helen, continue north on through downtown Helen on Highway 75. About a mile north of downtown, hang a left on 75A. In just a little over 2 miles you’ll then take a right on Highway 348, the Richard B. Russell Scenic Highway. From here, the real wandering begins. 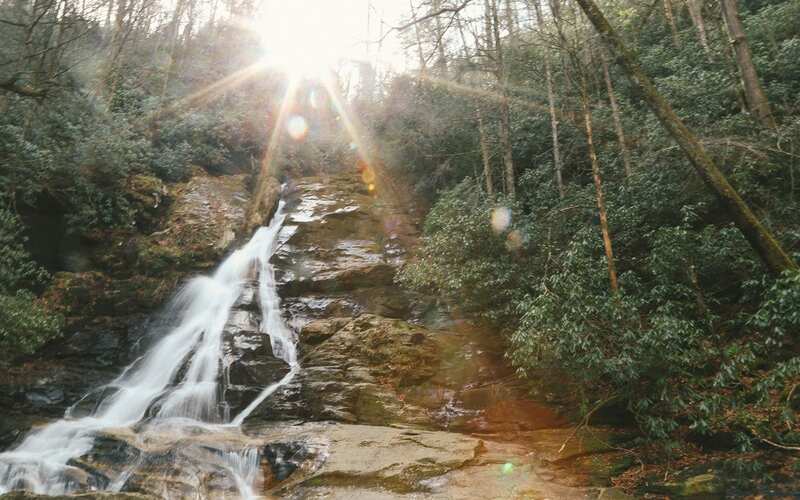 Within a few miles of getting started up the mountain, you’ll come across two great hiking options, Dukes Creek Falls and Raven Cliff Falls. Dukes Creek is about 2 miles round trip and Raven Cliff is about 5 miles. We think Raven Cliff is a little prettier and a much nicer hike but it’s definitely almost double the length so be sure to check out the profiles on our site or the much more in-depth and detailed reviews by our friends at Atlanta Trails if you’re trying to make a decision. Again, the entirety of the Richard B. Russell Highway is only 23 miles long. Down below we’re going to give you some options on going right or going left to make a circle back towards Helen, but for now, just sit back and enjoy the views as you continue heading north up the highway. There are going to be a few pull offs on the left hand side of the road if you want to stop for photos or to try and conjure up some cell phone service but for the most part just keep heading north until you get to Hogpen Gap. Hogpen Gap is a great spot to stop for a picnic as the Appalachian Trail crosses here and you can eat your lunch and chat with the thru-hikers. Hogpen Gap is pretty busy in the Spring with thru-hikers heading north on the Appalachian Trail while the rest of the year has day and overnight hikers (Hogpen to Unicoi Gap is a great section hike on the AT). 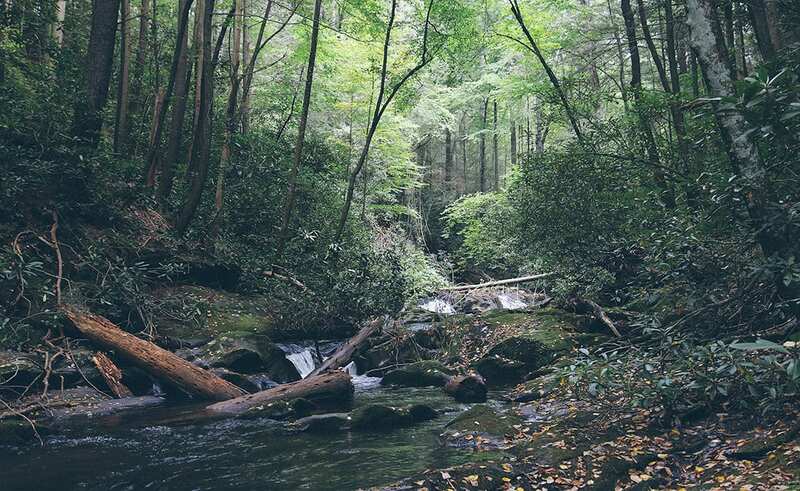 If you end up here during the spring when thru-hikers are moving through consider bringing some extra snacks, soft drinks, or beer with you and you can leave them at the trailhead for thru-hikers. Since they’re carrying so much weight they often don’t get many treats like candy or cold drinks so when someone leaves them a little “gift” it’s considered “trail magic” as you’re making their hike a little easier – for a moment at least. Hogpen Gap is pretty great in colder months as well because the rock wall immediately past the parking lot on the left gets huge chunks of ice and smaller icicles on it during the colder months. The Richard B. Russell highway usually gets closed after snow, but if you can catch it on a day when it’s been below freezing without snow, it’s one of the only places in Georgia where you’ll actually feel like you’re not in Georgia thanks to all the ice! When the ice has had a chance to sit up and freeze really good for long periods of time, you may even find some people ice climbing complete with their rock climbing gear. After leaving Hogpen Gap, continue heading north until you start winding down the mountain. After coming back into the valley you’ll have the opportunity for another waterfall hike at Helton Creek Falls. This one is super short and a great kid friendly option so if you’re looking for an easy waterfall hike on this trip, this is the one for you. The road does take you through a residential area and parking is notoriously tricky so please be considerate of where you are and most importantly pack out your trash. At this point you’ve hit the major highlights of the 23 mile stretch of the Richard B. Russell Scenic Highway and now you’ve got some options! The real key here is do you want to go left or go right. It all boils down to what you decide to do when the Richard B. Russell Scenic Highway ends. When you come down on the other side of the mountain you’ll come to a stop sign at the Highway 180 spur. 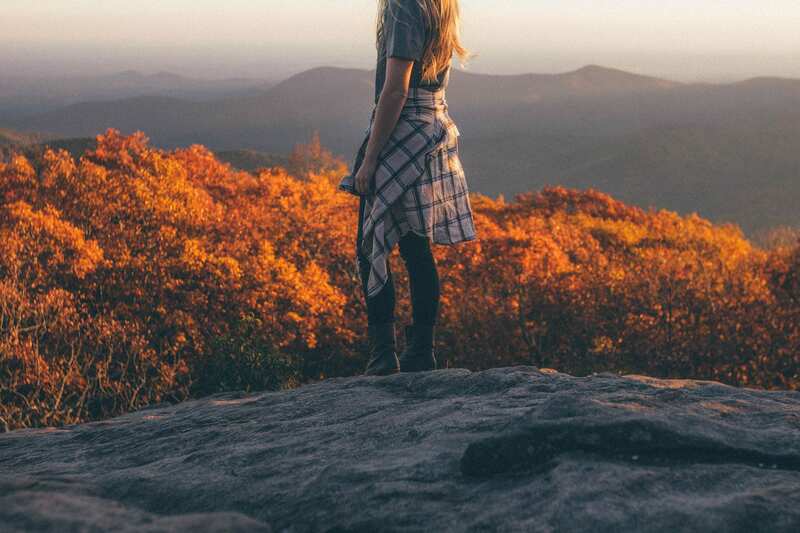 The “left” option will take you to places like Blood Mountain, Sunrise Grocery, Desoto Falls, Vogel State Park, Boggs Creek, and one of our all time favorite shops, Mountain Crossings. 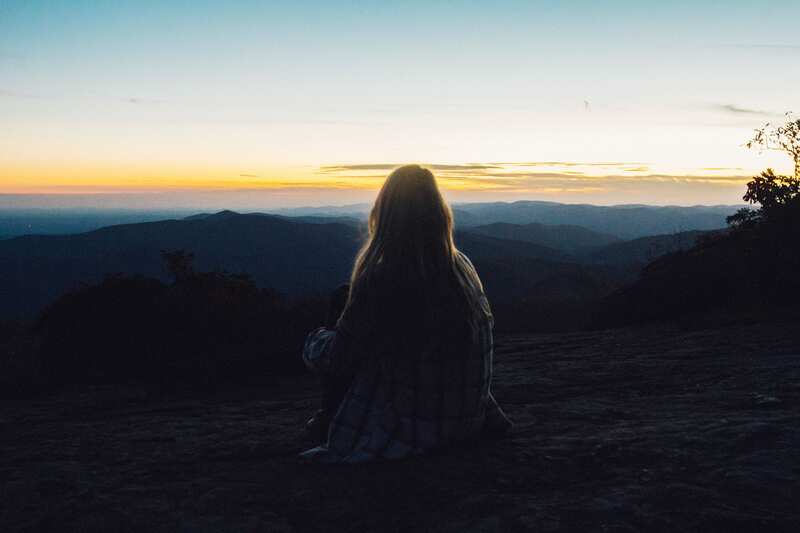 The “right” option will take you to places like Brasstown Bald, Horse Trough Falls and the dual High Shoals Falls and Blue Hole Falls and leaves you the option to kick back up to Hiawassee and places like Bell Mountain and Lake Burton. We’ll start with the going left option and then give you the details on the going right option. If you decide to go left, you’ll obviously need to hang a left on 180 at the stop sign. You’ll go maybe a mile until you get to the next stop sign at Highway 19. If you want to grab some lunch, going right or north on 19 will run you up to Blairsville in less than 10 minutes. But to get back into the main part of the road trip, take a left. Almost immediately you’ll come across Sunrise Grocery. Sunrise is a great little gift shops but this is the perfect spot to grab some boiled peanuts or their amazing beef jerky. A few miles down the road is Vogel State Park which is a great spot to camp if you need an overnight spot. A few miles past Vogel is Mountain Crossings which is single handedly one of our favorite spots in all of North Georgia. 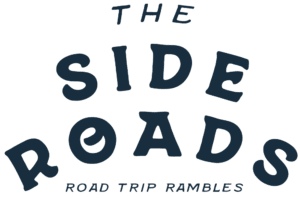 Their shop crosses through the Appalachian Trail meaning you can take off in any direction for an out and back day hike or you can just enjoy the views from their patio overlook. Blood Mountain is the big hike that is on this drive and if you have never been, we highly recommend it. Please keep in mind though it is one of the harder and more strenuous hikes in North Georgia. 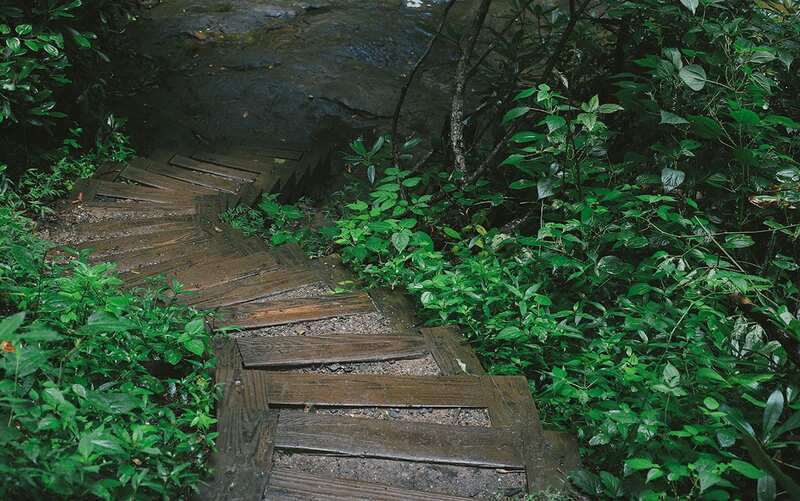 Again, we encourage you to check out the Atlanta Trails profile on the hike to know exactly what you’re getting into. But on clear days you can see the skyline of Atlanta from the summit. The key here is that if you’re going to hike Blood Mountain make sure that you park at the Byron Reece Trailhead parking lot north of Mountain Crossings and not the Mountain Crossings shop parking lot. Desoto Falls is just a few miles down the road from here as well. It’s an underrated waterfall in North Georgia that doesn’t get a lot of traffic but there are two falls at the site and the USFS runs a little campground here that is never full but always pretty year round. Our favorite time to hike here is in the winter as there is usually no one around for miles. Further down past Desoto Falls is Boggs Creek Recreation Area. Unfortunately they’ve closed off a majority of this road and campsites due to some storm damage a few years back but it’s still a fun spot to pop into if you have never been and does offer some native and stocked trout fishing in the creeks. From here you can ride back down into Cleveland and back around into Helen to complete the half loop or you can start working your way right through Suches and towards Dahlonega. If you decide to take the green loop from the map above, be sure to stop at Yonah Burger. If you decide to go right, you’ll obviously need to hang a right on 180 at the stop sign when the Richard B. Russell Scenic Highway ends. In our opinion, this is the “quieter” option. Going left gives you a ton of great spots to check out but it definitely feels like it has more traffic both on the roads and at all the stops. You’ll still find crowds on busy weekends but it always feels just a few degrees quieter for whatever that is worth. 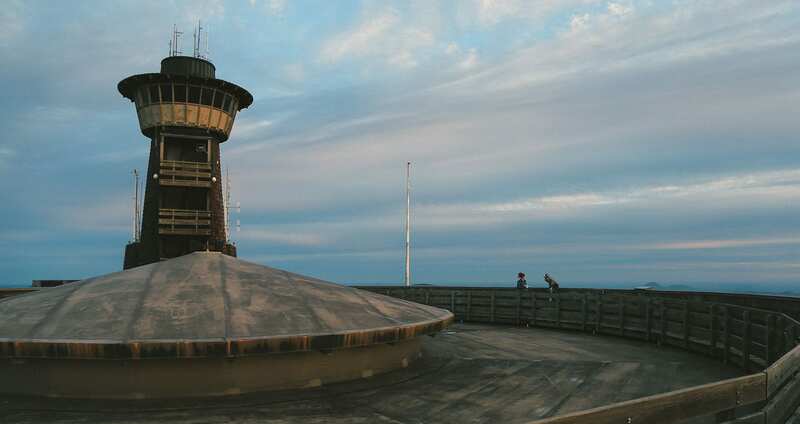 First up when you take a right on 180 is Brasstown Bald, Georgia’s highest spot. It doesn’t offer a big distance hike but it does offer a relatively short hike up a paved path or a complimentary bus tour during park hours to the summit. From here you’ll have 360 degree views of a huge chunk of North Georgia that offers amazing views of the stars, sunset, sunrise, and everything in between. Unfortunately Highway 180 doesn’t offer much else in terms of views or hiking so once you leave Brasstown, head towards Highway 17. From here if you take a left it’ll run you up to Hiawassee. We’re going to focus on what happens if you go right from here as you start heading south back towards Helen. 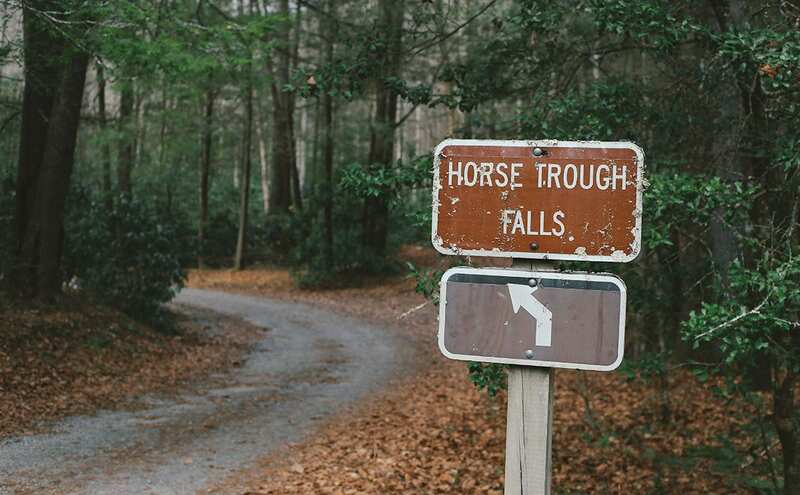 First up when you make this right turn is High Shoal Falls and Blue Hole Falls. This is a relatively easy trail in both distance and elevation that gives you back to back waterfalls at the end of the trail. There is a small creek crossing once you turn off for the falls that some cars with low clearance get nervous about. We have a Jeep now but have made that crossing dozens of times in four door cars. But you should do what you’re comfortable with. Further down Highway 17 as you get closer to Helen is a hidden gem called Horse Trough Falls. It’s buried back down a gravel forest service road but when you make it to the back you’ll have a gorgeous waterfall to check out. There are also a ton of primitive camping spots back here and the waterfall is super close to the source of the Chattahoochee River. Once you’re done here you can wind your way back to Helen by backtracking along the gravel road but if the weather is good, there is a gate near the Horse Trough Falls parking lot that is usually open. If it is and you want to take a gravel road back to Helen instead of a paved one, you can follow this as it bends and wraps its way back to Helen the long way. When the gate is open, this is one of our favorite drives and usually a perfect end to the day as we head back to Helen and a place like Village Tavern for dinner.